They say breakfast is the single most important meal of the day; Laurier student Aditya Manipadavu and thousands of local volunteers think so, too. Manipadavu, a third-year psychology student who is pursuing minors in biology and chemistry, recently finished a Community Service-Learning placement with Nutrition for Learning as part of a second-year class in community psychology. 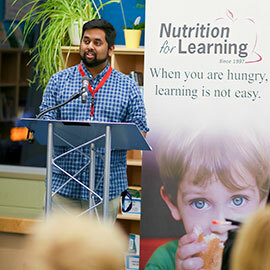 Nutrition for Learning is a non-profit organization based in Waterloo Region. With over 2,500 volunteers, it runs meal programs for children who may otherwise start the day hungry. The program operates at 136 schools throughout Cambridge, Kitchener and Waterloo, including all high schools. Manipadavu’s experiential learning opportunity was coordinated through Laurier’s Community Service Learning (CSL) program. Students who participate in CSL come from several Laurier programs, including Christian Studies and Global Citizenship, Global Studies, Human Rights and Human Diversity, Psychology, and Society, Culture and Environment. The courses, guided by a critical reflection component, combine undergraduate and graduate in-class learning with hands-on service-learning activities in the community. On average, Nutrition for Learning places between 10 and 15 Laurier students per semester in schools offering nutrition programs. Nutrition for Learning recently invited Manipadavu to speak at Volunteer Impact, an information-sharing event that brought together all of Nutrition for Learning’s volunteer program coordinators. In addition to his academic work, Manipadavu manages Laurier’s Residence Athletic Council, and is a campus ambassador and a don at the King Street Residence. “When I was part of a breakfast program, I found myself doing better than other kids,” says Manipadavu. “I can’t pin point it, but I think the program is a reason why my friends and I who participated are successful individuals. At Volunteer Impact, Manipadavu thanked all of the volunteers and stressed the positive impact that a nutrition program had on his life. “Giving back and supporting Nutrition for Learning has turned into something I’m really passionate about — and it complements the other things I’m doing on campus,” he says. Nutrition for Learning accepts new volunteers on an ongoing basis. Community service-learning at Laurier allows students to participate in creating positive change in their local communities, make strong connections between curricular and experiential learning, develop leadership skills and abilities, and gain hands-on experience with a community partner. Learn about Community Service-Learning courses, and more experiential learning, leadership and volunteer opportunities at Laurier.